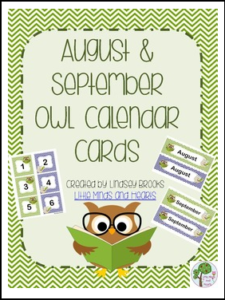 These owl themed calendar cards will complement any classroom calendar for the first month of school, whether you start in August or September! Calendar number cards measure 3″ x 3″ and follow an AB pattern. The header is 3″ x 9.5″ and comes in both green and blue chevron (you choose which to use) to match the cards. Numbers up to 31 are included, as well as blank cards.